When I started talking about commuting by bike with some of the parents at our son’s school, I realized that a lot of people found our plan for buying a cargo bike unfeasible. Our plan was: pay cash. In the case of our most recent bike, that was absolutely literal. I went to the ATM and got out some cash. (It was a cheap bike.) But most cargo bikes are expensive, far beyond even the daily withdrawal limit allowed by ATMs, which I personally have never even come near. And Matt and I are save-y people. For normal American families who have two cars and are thinking about cargo and family biking, there is often a transition problem. Most people have a fair bit of debt already: cars, student loans, consumer debt, maybe a house (a long shot in San Francisco, more likely elsewhere). If you want to ditch a car and switch to the bike, what do you do in the interim period, while waiting for the money from selling a car when you don’t yet have a bike? If you’re not sure about getting a bike but want to try it out, how do you afford a relatively expensive bike while holding onto the option of driving? Sure, it’s possible to get something cheap on craigslist once you know enough—astonishingly, this has even happened to me—but most people don’t start at that point. 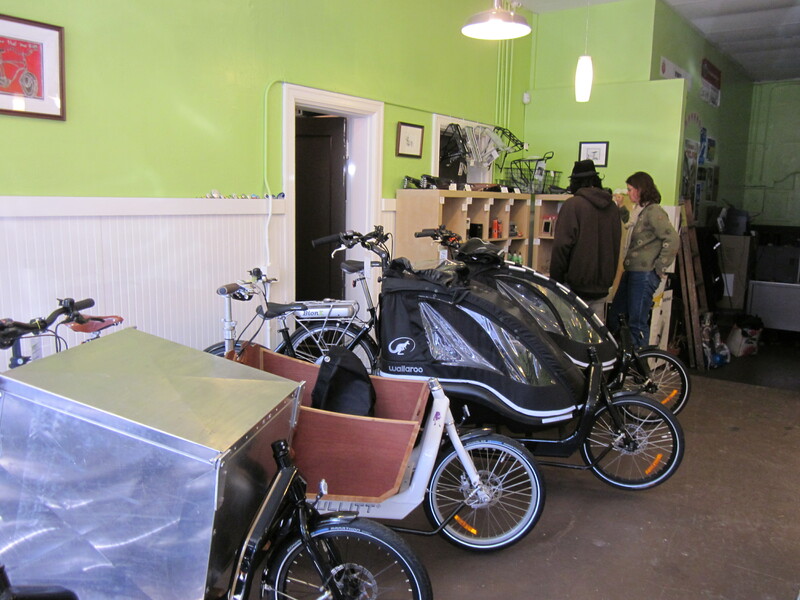 I was talking to a lot of people who were interested in trying out this riding-a-bike-with-kids thing but didn’t feel able to throw a thousand dollars in cash, sometimes much more if they lived on a steep hill and needed electric assist, at the idea. And they certainly didn’t have the confidence to try finding a used bike. These bikes could also be yours: a selection from the awesome Splendid Cycles. So when I heard that Portland credit unions offered bicycle loans (always Portland! ), I thought that sounded very clever. It elevated bicycle purchases to the status of cars or motorcycles by treating them as installment loans, rather than “max out your credit card” loans. And it solved the transition problem of going from a car-using family to a bike-using family. Sure, it involved taking on more debt in the short term, but for families who really used the bike, they’d start saving money soon enough–less gas, lower insurance rates, the freedom to drop a second car if relevant. And personally, although we believed we were committed, it took several months before we started defaulting to riding a bike with our kids rather than driving the car. And this is true even though getting our car out of our parking place is a nightmare. Finding a way to buy new riders time made sense to me. How about a Brompton? 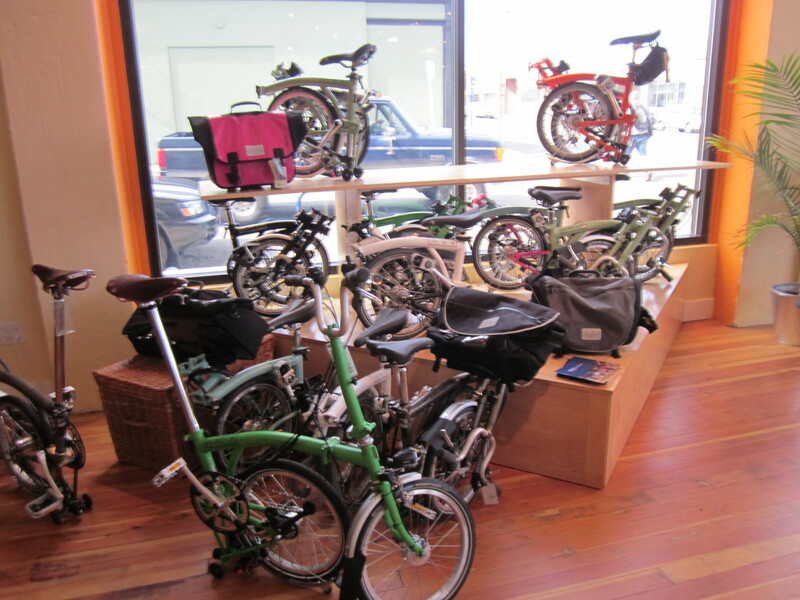 If you live in PORTLAND, there’s no shortage of choices at Clever Cycles. So I asked our credit union if they offered bicycle loans. They said no, never even considered it, but tell us more. So I did. They said, huh, interesting, we’ll get back to you. And I assumed I would never hear anything more again. So it was unexpected to say the least when I got an email earlier this week from the CEO of our credit union saying that they had decided to offer bicycle loans starting June 1st, 2012. There is a $5,000 maximum and terms of up to three years (update: the rate is currently 7%). But how cool is that? San Francisco Fire Credit Union is open to all city residents. If you’re looking for a new bike and think a bike loan might make getting it easier, well, now there’s a way. Awesome work! It’s always great to know the impact that just asking for something can have. I’ve never heard of loans for bicycles, except for a credit card program from Trek. I remember back in the day (1980s) that the student-run credit union at Cal made a lot of motor scooter loans. And way back in the day (1950s) my mother bought a $200 Singer Featherweight sewing machine with monthly payments. My mom had a Singer for making clothes, but got it later when it was perceived as a hobbyist machine. I can’t imagine seeing a loan for something like that now. Well, wow. Another reason to loveSFFCU! Good for you for asking, and good for them for taking your idea and turning it into action so quickly. Nimble little organization, for the win. Even neater is that they list the program under “vehicle loans.” Way to go, firefighters. I bank (is there a verb for credit union?) at SFFCU too and I’ve been noticing their promotions for bicycle loans. Congratulations on seeding the idea! I hope they get lots of takers and spread the idea. How did you convince SFFCU to offer the bicycle loans? I have been trying to convince the president of my credit union (Patelco) of the importance of offering bicycle loans since 2011. The first email I sent included links to other credit unions. It didn’t work. The response I got from the president/CEO was “My initial thought is that the most convenient means of financing a bike might be through our Visa credit card offering. Patelco’s Visa card comes with no annual fee making it quite convenient. None-the-less, I’ll ask our lending staff to give some consideration to the economics around a bicycle loan. At the high end, bikers are investing thousands of dollars.” My response include comments about how bicycles are good for the community and that people not buying high end bicycles are interested in bicycle loans too. And I just sent another email a few moments ago letting them know that SFFCU offers bicycle loans. Any other suggestions? I got the same first response as well: you could just use a credit card. My response was that (a) in SF particularly, getting an electric-assist might be beyond the usual credit limit; (b) installment loans are different–reported as a different type of credit, predictable payments, fixed payment period–and people value all of these things, which is why almost no one buys even the cheapest used car on a credit card even though it is technically possible; (c) offering installment loans for bicycles treats them as a valid means of transportation rather than a toy, and making that statement is important; and (d) installment loans typically offer a lower interest rate. Evidently something in that list was compelling, or SFFCU is just more open-minded. 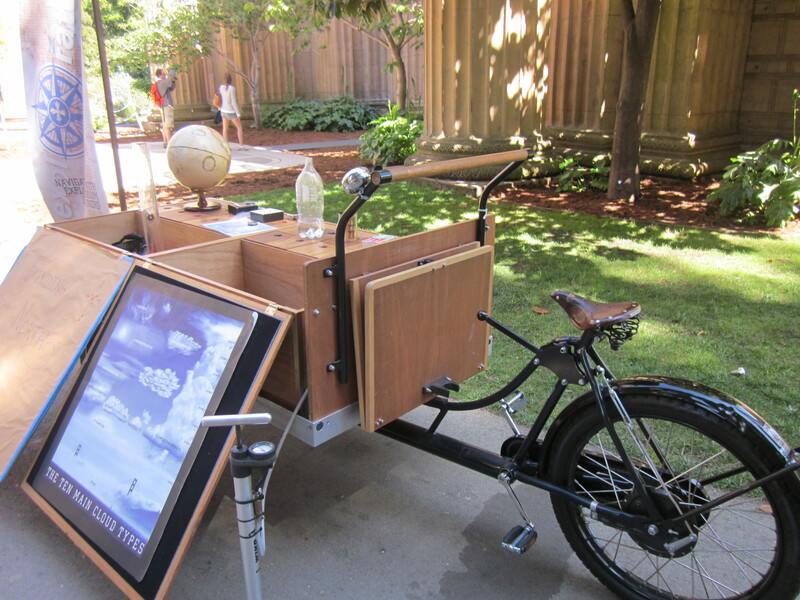 In Portland Unitus and Northwest Resource offer bicycle loans locally as well. So it is the coming thing. (Mission Federal in SF also used to offer them; I’m not sure if they do anymore after their reorganization.) I’m not a Patelco member but I hope that they change their minds! Thanks! I will see if this line of reasoning gets me any closer. Fingers crossed.